Osage-Orange (Maclura pomifera, family Moreaceae (mulberry family)) has long been one of my favorite trees. What's not to like? Grows anywhere, has glossy, dark green foliage and deeply fissured orangish-tan bark with great winter interest. Just don’t stand or park your car under female trees at this time of the year. You can avoid the potentially head concussing or windshield smashing large fruits by selecting more mannerly cultivars. Taking that route can make this tough native tree a go-to for difficult urban sites. Osage-orange was first discovered in 1804 growing in a relatively small native range confined to the eastern part of the Red River drainage watershed in Oklahoma, Texas, and Arkansas. The "Osage" part of the name comes the Native American tribe living in part of the tree's native range and the "orange" is derived from the general appearance of the tree's fruit. Indeed, there are other common names that also refer to the fruit including: hedge-apple, horse-apple, hedge balls, and mock-orange. The beautiful, highly durable wood was prized for making bows which is referenced with other common names such bodark, bow-wood, and bois d'arc ("wood of the bow"). Although both the fruit and branches ooze a latex-like sap when cut, several studies have shown that the fruit is not poisonous to livestock, wildlife, or humans. Osage-orange trees can now be found going in all 48 contiguous states. Its widespread distribution was supported by its boundless adaptability to wide-ranging environmental conditions and its use for several utilitarian purposes. Trees were planted as living fences prior to the development of barbed wire. Dense, crossing branches and sharp spines growing from the leaf axils discouraged livestock from crossing close-planted hedges. It was also one of the primary trees used in Works Progress Administration (WPA) programs aimed at preventing soil erosion. Thousands of miles of Osage-orange shelterbelts were planted throughout the 1930s as part of WPA soil stabilization efforts. 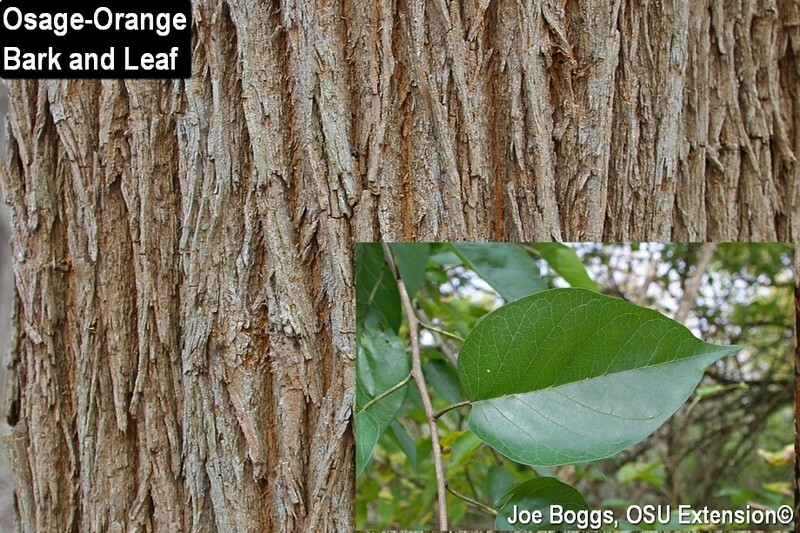 The adaptable nature of Osage-orange is illustrated by Michael Dirr in his Manual of Woody Landscape Plants (Sixth Edition), "One of our very tough and durable native trees; transplants readily; the poorer the site the better; withstands wetness, dryness, wind, extreme heat, acid and high pH conditions once established …" Trees are also relatively free of serious pest and disease problems. Of course, large fruits and spiny thorns are two potential drawbacks. The hard, roughened fruits range in size from 3 - 5" in diameter and have been known to crack car windshields. However, Osage-orange is dioecious meaning that there are both female and male trees; only female trees produce fruit. So the answer is to plant male trees. The thorny issue of the prickly spines can be solved by selecting cultivars that are so-called "thornless." Two well-known male and thornless cultivars are 'White Shield' and 'Wichita.' Finding these cultivars may be a challenge; however, they are worth the effort. Also, make certain to be specific when purchasing trees. A web-search showed that the straight species is widely available for naturalized areas; these trees will have thorns and may be females. Finally, there is no research evidence supporting the stubborn myth that the fruit repels insects and spiders. Researchers have found chemical compounds in the fruit that has some insect repellency properties; however, the natural concentrations of these compounds in the fruit are far too low to serve as an effective repellent. On the other hand, as demonstrated below, throwing the fruit at insects and spiders can have an effect.